Qantas opens its all-new lounge at Singapore’s Changi Airport today with a host of high-end features including a Neil Perry Rockpool menu, hawker centre-inspired open grill station, a cocktail bar plus a valet service for top-tier frequent flyers. 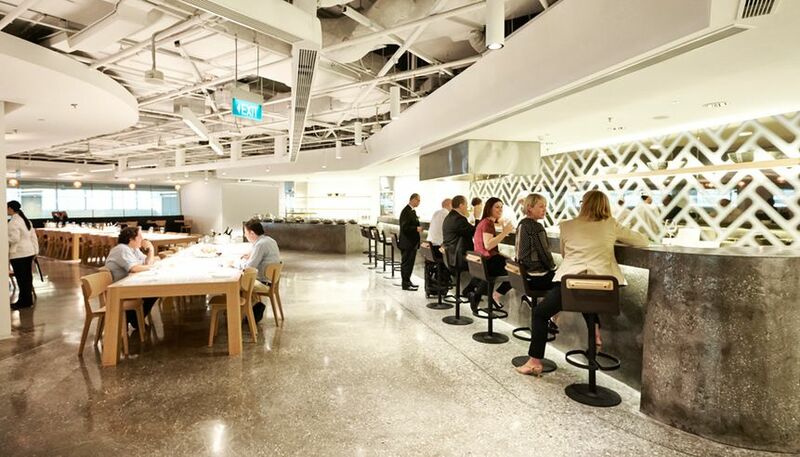 Revealing a new concept for the airline’s international lounges, the Qantas Singapore Lounge draws on Qantas’ flagship lounges in Sydney and Melbourne while adding several new elements into the mix. 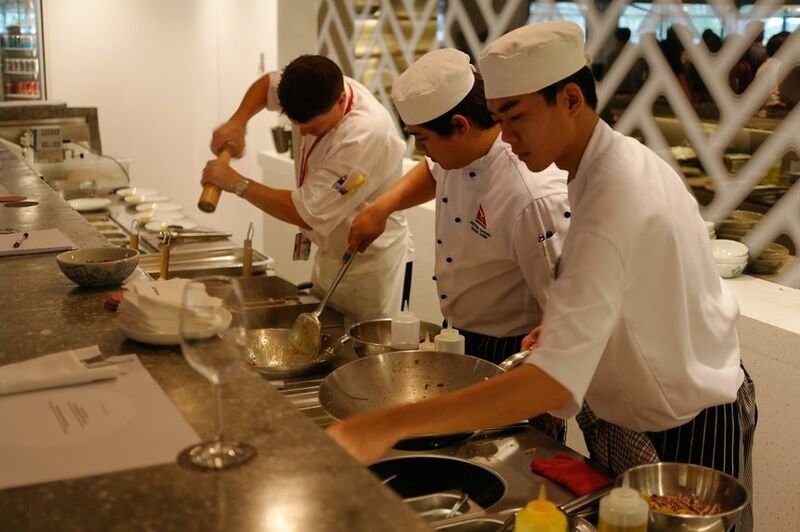 This includes a live cooking station and communal dining areas inspired by Asia’s lively hawker centres. 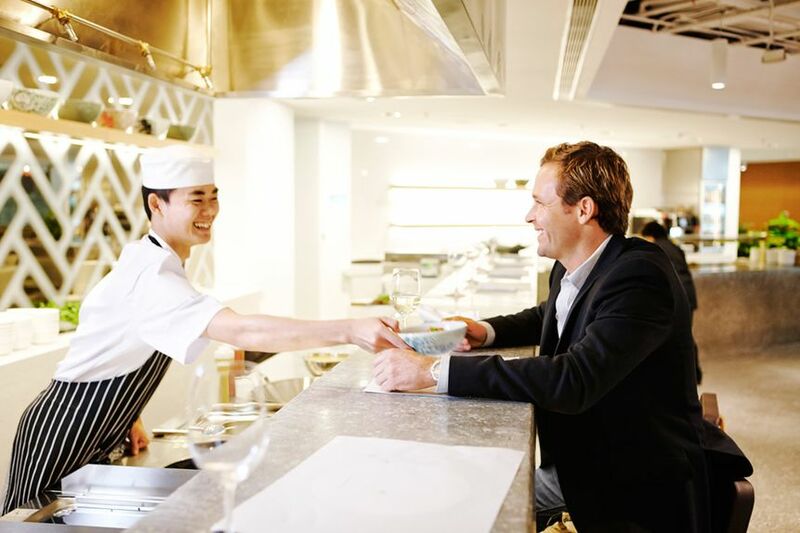 Qantas’ consulting chef Neil Perry has lent his culinary skills to the lounge, with menus based on his Rockpool restaurant empire – specifically Perry's acclaimed Spice Temple eateries in Sydney and Melbourne – to serve dishes are built around regional cuisine and flavours. 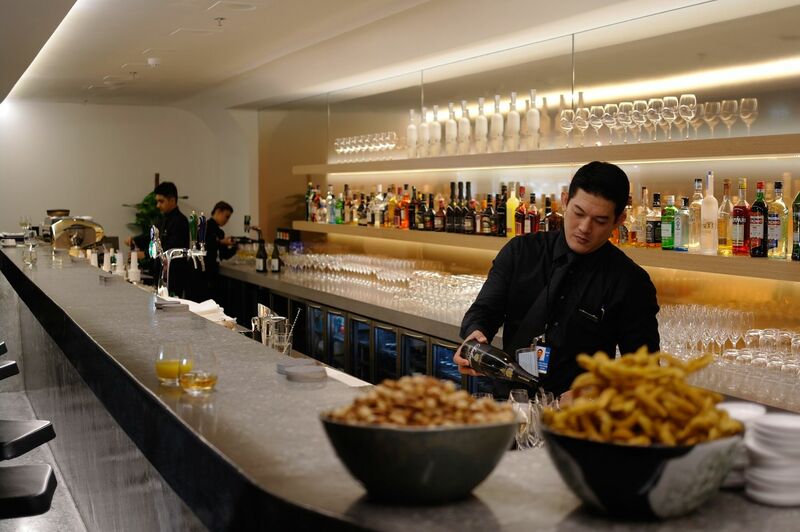 The lounge's meal service also includes a plate of the day tray-around service featuring some favourite items from the Sydney and Melbourne First lounges – including the famous salt & pepper calamari, club sandwiches and mini-burgers. That's all alongside the standing menu and an extensive buffet. Travellers can wash their meal down with a cocktail, glass of wine or freshly-pulled barista coffee. The lounge's Y-shaped design creates three main spaces beyond the slick lobby. One 'wing' houses the dining area, part of which you can see above. This includes the cooking stations and buffet, with a series of shared dining tables running around the perimeter of the lounge. 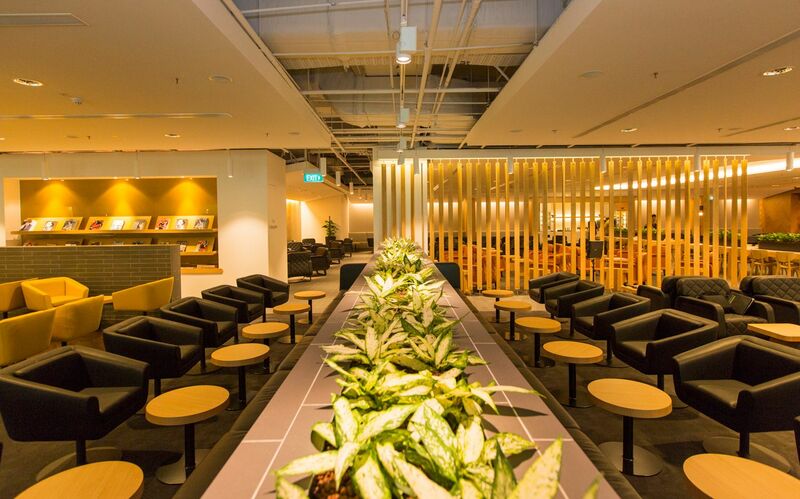 The other wing is where travellers can relax before or after their meal. ... in a variety of styles and configurations. There are also several long tables where you can park your laptop or tablet (AC power sockets are underneath the table). Joining both of those zones together is the cocktail bar. 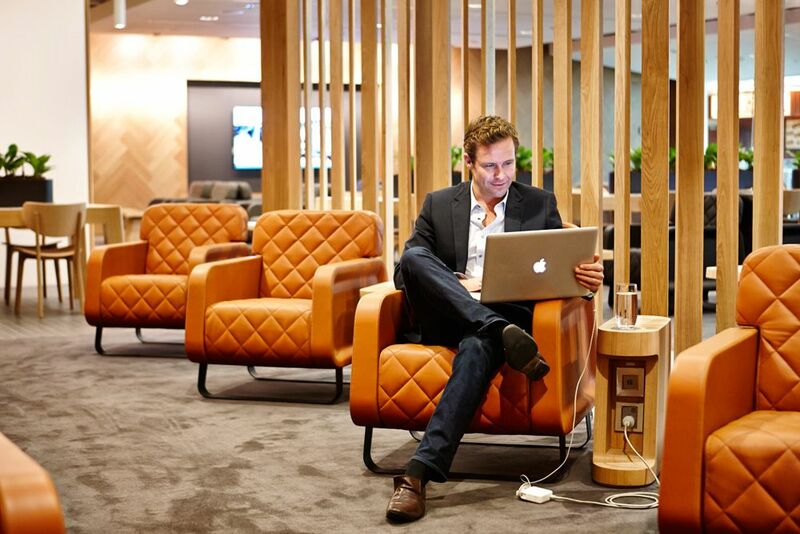 “The Singapore Lounge has been designed to complement the destination” says Simon Hickey, Qantas International CEO. 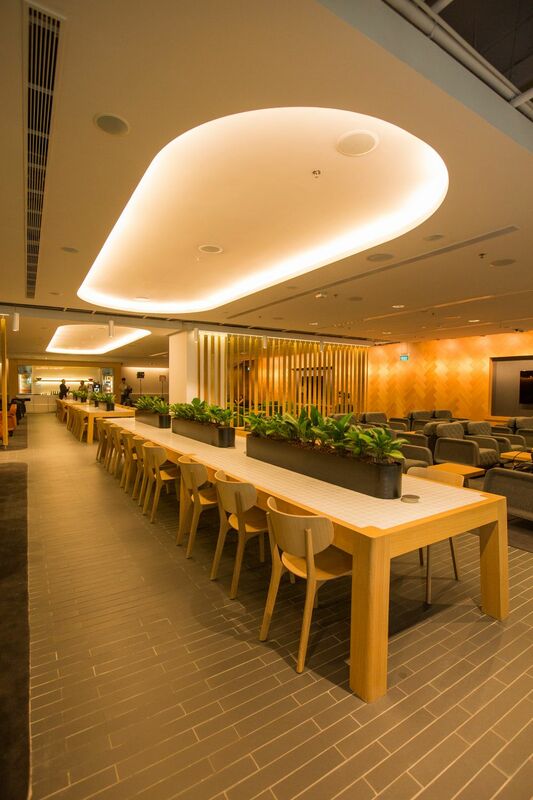 “It’s vibrant and elegant, spacious and luxurious, and it’s the perfect environment for our customers to relax before their flight." 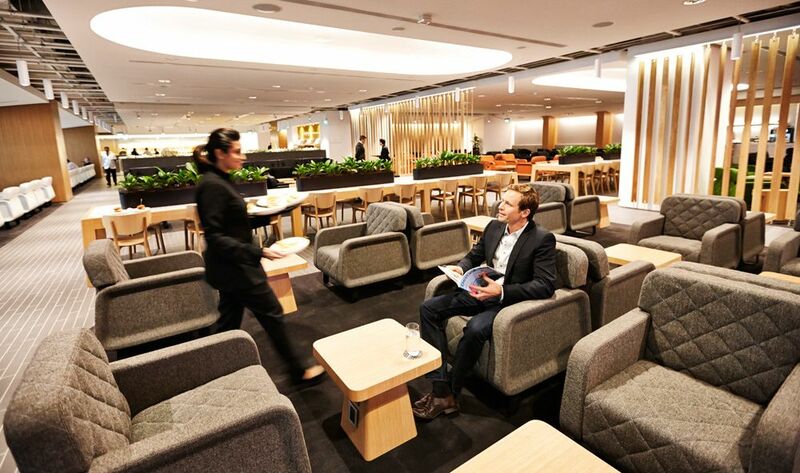 The Qantas Singapore Lounge replaces the separate First and Business class lounges operated by Qantas and British Airways under their now-defunct joint venture. But there will still be a few perks reserved for those sitting at the top of the frequent flyer food chain. 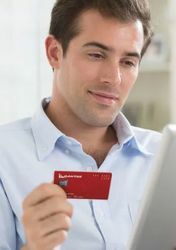 Platinum One members of Qantas Frequent Flyer scheme will be offered shirt pressing and a shoe shine, and also have first dibs at reserving one of the 20 shower suites. 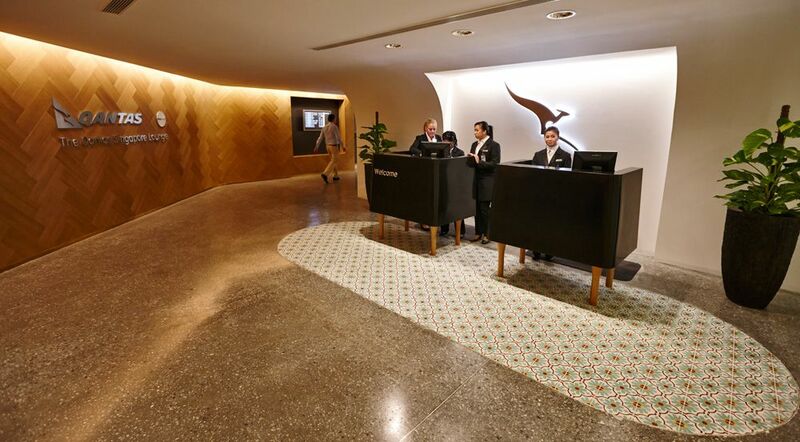 Members of the Qantas Chairman's Lounge will find three showers reserved for their use, each with complementary packs of Payot skincare products and even DIY manicure kits. Other creature comforts include 80-inch flatscreen TVs, fast and free wi-fi and plenty of AC powerpoints and USB ports scattered throughout the lounge. Australian Business Traveller is visiting Singapore as a guest of Qantas. I thought the Sydney one came first? David, how many shower suites are there in total? I suppose there won't be this mad rush at 6-7pm and 10-11pm for the showers now that you haven't got 2 x A380, 2 x 747 and 1 x 777 vomitting its content all at around the same time! There are 20 shower suites all up. Thanks David. Thank you too for reporting on this! I love how they've incorporated a subtle oriental feel in the decor - The wooden wall fixture and the peranakan-style tiles by reception perfectly accentuates the black reception desks and the silver kangaroo fixture on the wall, which ressonates with the colours of the CSM's uniform. What about Skywards Gold/Plat travelling on EK? You will be allowed in. Just show them your boarding pass and the EK Card. Edy: we've confirmed with Qantas that Skywards Gold and Platinum can use the lounge if they're on Qantas or Emirates flighjts. Thanks! I will sample the lounge next Friday then. Did I read somewhere (perhaps not here) that there was going to be a seperate area for Platinum and above or did I dream that? You must have read that elsewhere, because there's no such thing here - it's all just one big space. The "exposed" ceiling in the dining area jars the eye, a strange choice indeed. They're a requirement of Changi Airport's safety regulations in regard to fires. Does anyone know, if I arrive on QF5 transiting through SIN for CMB, can I use the lounge? You can if your onward flight to CMB is on EK and you're flying F/J or are a Skywards Plat/Gold or QF P1, Plat or Gold or QC member. Do people on Jetstar Business Max fares get entry to this lounge? I am QF Platinum but have 5 work collegues with me not all of whom have QFF memberships. "When flying Business Max on a Jetstar operated flight with a JQ, 3K or VF flight number (or QF flight number for Qantas passengers travelling codeshare), passengers departing from airports with a Qantas Club or Jetstar partner lounge will receive complimentary access prior to their international flight where seated in the Business Cabin... Business Class passengers that have not purchased a Max bundle do not receive access to the lounges, unless the lounge is a Qantas Club lounge and the passenger is a Qantas Club member." 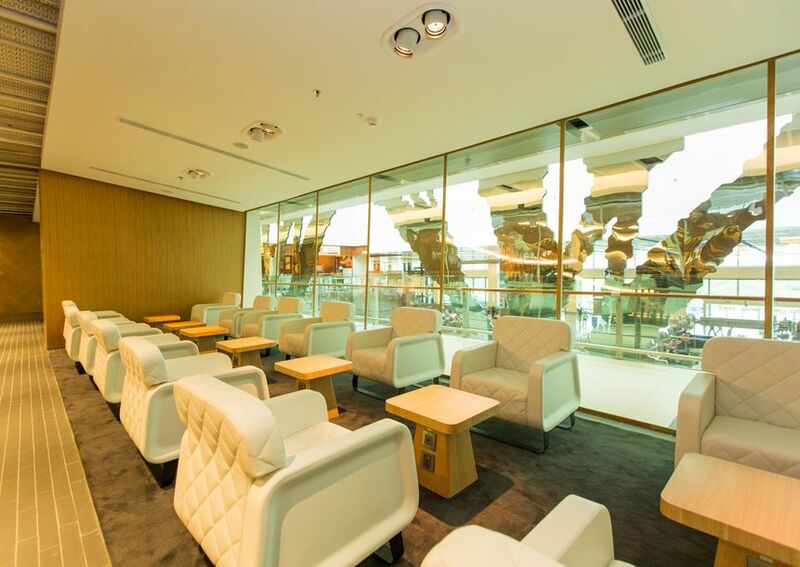 Readers who have visited both the new QF and BA lounges which do you think is better? Designed by Sumo & Caon Studio. We purchased 4 business class tickets on Qantas using our frequent flyer points from Adelaide to Singapore and Singapore to Adelaide. Both legs are via Melbourne. We are flying Qantas to Melb then Emrates to Singapore. On the return leg we fly Jetstar business and Qantas. 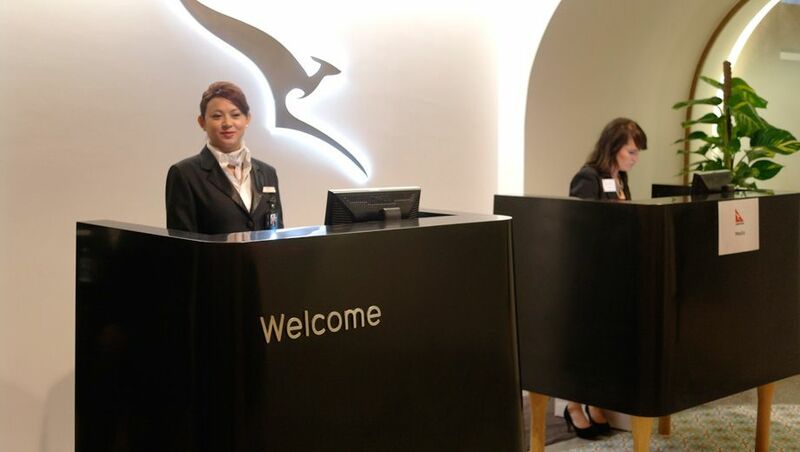 We, as business passengers have access to Qantas / Emrates lounges in Adelaide and Melbourne however we have been denied access to the Qantas lounge in Singapore as we are told our Jetstar business frequent flyer booking does not qualify for access. fWe are told we need a business max fare - one that was not offered by Qantas. All legs of the travel have Qantas code share numbers but we have been allocated Jetstar so access denied. Any help on this matter would be appreciated. Nice lounge, nicely set out and enough capacity so it's not teeming with people, a decent spread of nice n tasty food- cooking station ... And most important of all... Singapore slings... Which I'm sipping on as I write this comment... 10/10 "Red roo"
Comment on "Qantas Singapore Lounge: a dash of luxe for Lion City travellers"